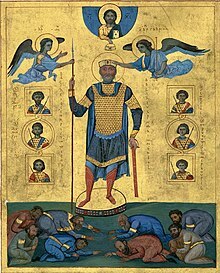 Painting of Basil II, from an 11th century manuscript. Basil II (958 – December 15, 1025), was a Byzantine emperor from the Macedonian dynasty from January 10, 976 to December 15, 1025. Under his reign, the Byzantine Empire reached its greatest height in nearly five centuries. This page was last changed on 1 March 2018, at 04:35.